Making creepy food for a Halloween get-together is one of my favorite ways to celebrate the holiday and I am always looking for new ideas! It can get a little time consuming when putting together more then a couple of spooky dishes, so I like to do a Halloween potluck and ask each guest to bring one too! Plus, it's so much fun to see what everyone comes up with! I'm not a big fan of eating spooky food, but I will admit these are pretty creative!! I like the teeth one - I haven't seen that one before! These are all so cute! Oh I love the soup with the spider web. It look so easy! Great for dips too when you go to a party. So cute, I just "pinned" it. :) LOVE the new blog layout, Andrea! 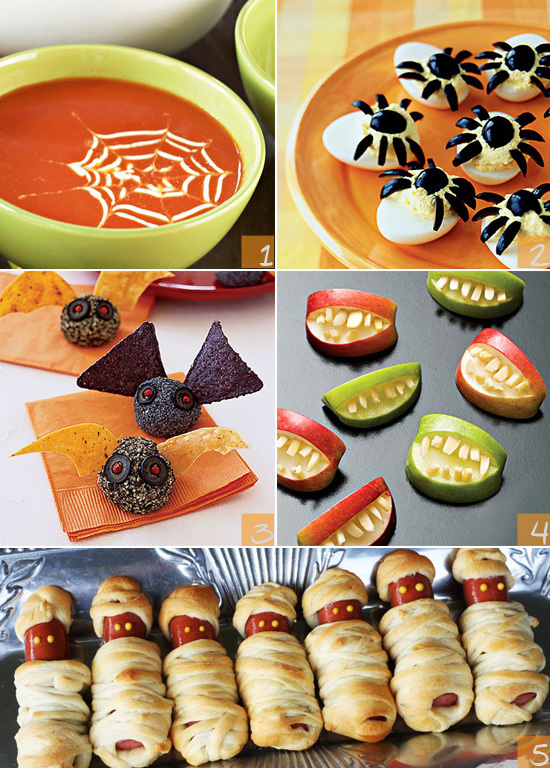 I made those funny mummy hotdogs last year :-) Love the spider deviled eggs! these ideas are so creative!! now i need a halloween party to make some of these, newest follower, cute blog! I love those little mummy hotdogs... my son and i made them last year and he thought they were the best!